Coat a 10½ inch deep dish pizza pan (or a pizza pan that you buy at the store like we did) with cooking spray and coat lightly with cornmeal. Coat work surface with flour and roll dough to 14 inch diameter (or whatever diameter your pan is). Transfer dough to pizza pan and let rise till puffy. Brush dough with olive oil and spread with pizza sauce. Top with pepperoni and whatever other toppings you want. Sprinkle with parmesan and mozzarella cheese (or whatever kind of cheese you are using). 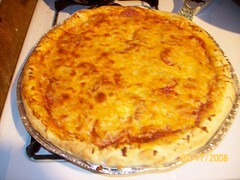 Bake until crust is browned, top is bubbly, and cheese is melted -- usually 12 - 16 minutes.